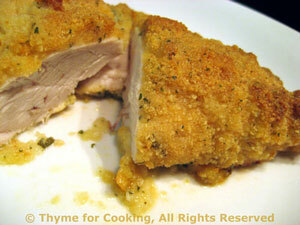 Baked Chicken with Mustard Crust, Thyme for Cooking's Healthy Weekly Menu. One last zucchini..... And easy dinner from the oven. 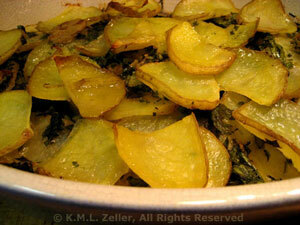 Gently reheat, either in microwave or with everything else in the oven, for 15 minutes. Sliced courgette, mixed with eggs, yogurt, Parmesan and baked. What could be easier? The paprika adds a bit of spice to the dish, and a lovely pale orange color. Use Smoked Paprika if you have it. Cut the zucchini in quarters the long way, then into thin slices, 1/8" (.3cm). In medium bowl lightly beat eggs, Parmesan, yogurt, mustard and paprika. Add zucchini and stir to mix. Brush the olive oil in a baking dish large enough to hold the gratin easily. I used a 7" (18cm) round. 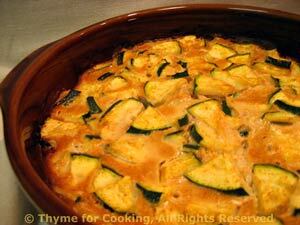 Pour zucchini mixture in and bake for 30 - 35 minutes at 400F. Center should not jiggle when done (or only slightly). Remove and serve from baking dish.